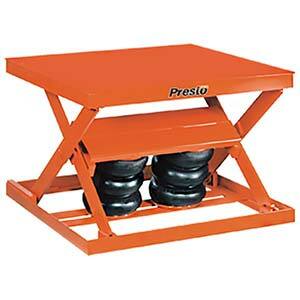 Pneumatic scissor lifts position loads at the exact right height to eliminate bending, stretching, and straining. They increase productivity and reduce injuries in manufacturing, machining, shop, and assembly operations. These lifts use shop air rather than electricity and hydraulics to raise and lower loads, resulting in reduced maintenance costs. An air supply of 80 psi @ 15 cfm is required. Standard pedestal control allows easy lowering and raising; a foot control option is also available. The lift remains in position unless "up" or "down" control is activated. Lifetime warranty on Firestone actuator (airbag). PRST-AX10-3648 1000 36" x 48" 29" 8"
PRST-AX10-4848 1000 48" x 48" 29" 8"
PRST-AX10-4856 1000 48" x 56" 29" 8"
PRST-AX10-4860 1000 48" x 60" 29" 8"
PRST-AX20-3648 2000 36" x 48" 32" 8"
PRST-AX20-4848 2000 48" x 48" 32" 8"
PRST-AX20-4856 2000 48" x 56" 32" 8"
PRST-AX20-4860 2000 48" x 60" 32" 8"
PRST-AX40-4848 4000 48" x 48" 32" 8"
PRST-AX40-4856 4000 48" x 56" 32" 8"
PRST-AX40-4860 4000 48" x 60" 32" 8"